One fine morning, Mr. X a 60 plus gentleman complained of numbness and tingling in his left arm. Everyone in the household got worried for him. The family members got worried that this numbness might be a transient ischemic attack or a mini-stroke. Mr. X was rushed to the nearest multi-specialty hospital. A neurologist saw Mr. X in the emergency room. Suspecting a mini-stroke, she sent him for a CT scan of the brain, which came up normal. Because early strokes don’t always manifest on a CT scan, she ordered an MRI of his head and brain stem as well, which also revealed nothing unusual. Then she decided to admit him and start him on blood thinners. The following day, Mr. X got an echocardiogram to see if there was a blood clot in his heart that could have partially dislodged and landed up in his brain. There was not. Mr. X also got a trans-esophageal echo, in which an ultrasound camera was passed via a stiff tube into his mouth, down his throat, and into his esophagus to get close-up views of his heart. It too was unremarkable. Over the next couple of days, Mr. X underwent a battery of further tests: a carotid ultrasound, a transcranial Doppler, a lower-extremity Doppler, and a chest CT. The studies all showed normal results. The doctors didn’t want to keep any stone unturned. When the neurologist was informed of the nurse’s findings, he walked over to Mr. X and, looking surprised, had him perform the exercises again. Sure enough, the numbness was reproducible, suggesting that Mr. X only had a pinched cervical nerve, a relatively benign condition. Appearing chastened, the neurologist said the MRI was now probably unnecessary but advised to have it anyway—now with the range of the images extending into the neck—to eliminate any residual uncertainty. It confirmed what the nurse had suspected: a pinched nerve(a name given to the uncomfortable sensation, pain, or numbness caused when increased pressure leads to irritation or damage to a peripheral nerve – A peripheral nerve is one that is outside the brain and spinal cord). A result of this chaos – A $10,000 (Approx-Rs.7,00,000) hospital bill and a great deal of discomfort, worry could have easily been avoided. God forbid if anyone steps in the shoes of Mr. X, then the first thing would be to blame the hospital management. On the other hand, the doctor needs to be assured from his side about any underlying pathology. The pointing fingers and legal matters can worsen the condition and tarnish the image of the hospital in the long run. Role of physical examination and evidence-driven diagnosis in today’s healthcare- The role of physical examination in modern medicine is to help doctors decide rationally, not blindly, when to turn to technology. The mention of physical examination, not necessarily the old archaic ones in the medical textbook that needs two days to perform the complete procedure, but a relevant protocol. In today’s healthcare scenario, the time to concentrate on proper examination technique is decreasing—for example, laying your patient down at an angle of 30 degrees and measuring her jugular pulsations with a ruler—when you had 15 patients in the queue? Use of the stethoscope, the ophthalmoscope, and the tendon hammer, to percuss the body, sounding out its hollows, the territorial boundaries of lung and liver is competing with machine diagnosis. Despite the technical advances and sociological changes, the care of the patient is based on very human transactions. This often requires balancing strategies especially as medicine advances and systems of care evolve. The current rate of change, particularly within the structures and environments in which doctors’ work has created difficulties for the profession. This is akin to a sliding zone where traditional training and professional expectations have not intersected happily with current demands and future trends. In contemporary health care, touch – contact between a doctor’s hand and a patient – appears to be on its way out. The expanding role of CT and MRI imaging is decreasing reliance on touch as a way of making diagnoses. Pressures to move patients through the system more quickly leave health professionals with fewer opportunities to make detailed contact. Yet despite the rise of scanners, robots, and other medical inventions, the physician’s hand remains one of medicine’s most valuable diagnostic tools. Touch creates a human bond that is particularly needed in this increasingly hands-off, impersonal age. Medical practice is replete with situations where touch does more than any words to comfort and reassure. The physician’s working with his hands or using his senses to make a diagnosis, as Hippocrates and Galen had done, was not just a purpose or social climbing. It made sense because the illness was considered a unique imbalance in each individual, the patient’s account of his or her disease took precedence over what a physician could observe. The patient with icy hand, coarse dry skin, hoarse voice, puffy face, sluggish demeanor and hourglass swelling in the neck — signs of a thyroid that’s running out of gas. Let’s not call this intuition – an unfashionable term in our algorithmic world. Reasons for this tactical shift from touch to touch screen- The need of a seriously ill patient is above common. He or she has entered another kingdom, a place and a process that is frightening; that patient’s greatest need is both scientific state-of-the-art knowledge and genuine caring from another human being. Caring is expressed in listening, in the time-honored ritual of the skilled bedside exam — reading the body — in touching and looking at where it hurts and ultimately in localizing the disease for patients not on a screen, not on an image, not on a biopsy report, but on their bodies. Three things have greatly hindered this are- time constraints, work overload, and communication issues from the caregivers’ side. Doctors & nurses have started adopting the technology to reduce manual work, to provide more accurate service, and impactful interventions to patients. But more the dependence without taking account of the negative sides; it can result in discomfort to the patients in terms of diagnosis and cost. With the volume of data going up at a staggering rate, traditional analytic methods have been revamped and there has been a change in the clinical decision-making techniques. DATA DRIVEN HEALTHCARE – A HANDY TOOL? When the hue and cry about the word ‘data’ are high one should know what it means. ‘Data’ is factual information (such as measurements or statistics) used as a basis for reasoning, discussion, calculation or treatment. From where does this data generate? –Well, the moment a person thinks he/she is ill and contacts the physician. The call record, demographic details, investigations, and treatment all account to the data. The role of Machine Learning & Artificial Intelligence, modern tools of the 21st Century, becomes prominent. Machine learning is a method of data analysis that automates analytical model building. It is a branch of Artificial Intelligence based on the idea that systems can learn from data, identify patterns and make decisions with minimal human intervention. AI is a collection of multiple technologies that mimic human’s cognitive functions. Apart from all the industries, it has been touching, you can say that the modern healthcare industry has been receiving paramount benefit. The “bedside informatics,” of an I.C.U., a blizzard of monitors from disparate manufacturers displays EKG, heart rate, respiratory rate, oxygen saturation, blood pressure, temperature and much more. The physician or the nurse walks in and looks at 10s of seconds of information, a snapshot at that moment. What these monitors do exceedingly well is sound alarms, an average of one alarm every eight minutes, or more than 180 per patient per day. There has been a paradigm shift in the way patients are treated by doctors because they now have inordinate amounts of data in their hands, and a good amount of this data can be put to good use. What else is this data-driven world doing in healthcare? Clinical documentation is an area that takes up so much time but with the possibility of voice recognition and dictation, combined with natural language processing, a lot of time and effort can be saved. This can become a major boon for doctors because information retrieval is a strong aspect of AI. Big Data analytics along with the Internet of Things (IoT) is revolutionizing the way one can track various user statistics and vitals. Apart from the basic wearable’s that can detect the patient’s sleep, heart rate, exercise, distance walked, etc. there are new medical innovations that can monitor the patient’s blood pressure, pulse Oximeters, glucose monitors, and more. The continuous monitoring of the body vitals along with the sensor data collection will allow healthcare organizations to keep people out of the hospital since they can identify potential health issue and provide care before the situation goes worse. Predictive analysis can help resolve this issue by predicting the admission rates and help with staff allocation. This will reduce the Rate of Investment incurred by hospitals and in fact help utilize their investment to the max. The insurance industry can save money by backing wearable’s and health trackers to ensure that patients do not spend time in the hospital. It can save wait time for needy patients since the hospital will have adequate staff and beds available as per the analysis all the time. 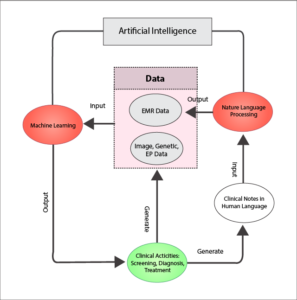 Source- How Artificial Intelligence is Changing the Healthcare Industry.htm The flowchart above makes it evident that there are mainly two kinds of AI devices: ML (Machine Language) and NLP (Natural Language Processing). If all the hospital records are digitized, it will be the perfect data that can be accessed to understand the pattern of many patients. It can identify the patients approaching the hospital repeatedly and identify their chronic issues. Such understanding will help in giving such patients better care and provide insight into corrective measures to reduce their frequent visits. It is a great way to keep a list and check on high-risk patients and offer them customized care. It is possible to raise patient engagement to the next level through Intelligent Virtual Assistant (IVA) and Medical Virtual Assistant (MVA). Now medical assistance has gone beyond wearables by urging patients to not just manage their goals, but also to actually help them look after their health like a real assistant would, and perhaps even more. There are health monitors and other devices that have AI incorporated in them. A lot many times it has been noted that the professionals tend to either prescribe a wrong medicine or dispatch a different medication by mistake. Such errors, in general, can be reduced since Big Data can be leveraged to analyze user data and the prescribed medication. It can corroborate the data and flag potential out of place prescription to reduce mistakes and save lives. Such software can be a great tool for physicians who cater to many patients in a day. The crux of the matter is that ‘Big Data’ can be a useful precursor for advancement in science and technology. It will not only be able to provide accurate solutions, but also offer customized solutions for unique problems. If every hospital were connected, we would have a monster database, Big Data that’s truly big and that would allow us to spot trends in the disease so much earlier and determine best practice and predict complications. Million Dollar question remains-Is the technology hitting the right target? Much of the situation like Mr. X is a result of miscommunication, patients falling through the cracks, knowledge not being transferred and so on, but some part of it is surely from failing to listen to the story and diminishing skill in reading the body as a text. Hospitals incur huge costs of upkeep with the data-driven world in terms of infrastructure and manpower training. But if things don’t trickle down to the needy and there is no ROI for the investment, then things get really chaotic. The role of machines and gadgets is to assist the trained. The ML and AI can be further augmented by the additional layer of right communication practices for both the implementer and users’, and then it is possible to cut down errors in the field of health care. A balance between clinical evidence-based practice along with data-driven technology holds promise to a better healthcare.